Among the Zintanis’ allies only the Warshefana are currently engaged in hostilities against the Misratan and Islamist bloc. The HoR responded to the triumph of Operation Libya Dawn by branding its forces as well as those of Ansar Al-Sharia as terrorists. It promoted polarisation mirroring the moves of Operation Dawn. It also created a climate in which ‘moderate’ Islamists like the MB and Misratans were keen to work with the emerging ISIS groups. Benghazi has been the scene of further violence as General Khalifa Haftar renewed his attacks against Islamist targets in key neighbourhoods of the city. Libyan Air Force (LAF) commander Saccar Jurushi confirmed this week that LAF jets had carried out a number of airstrikes in Derna. Reports emerged on 18 August that several camps belonging to Libya Dawn in Tripoli were the targets of airstrikes. As of yet it is not clear who was responsible for the attack. 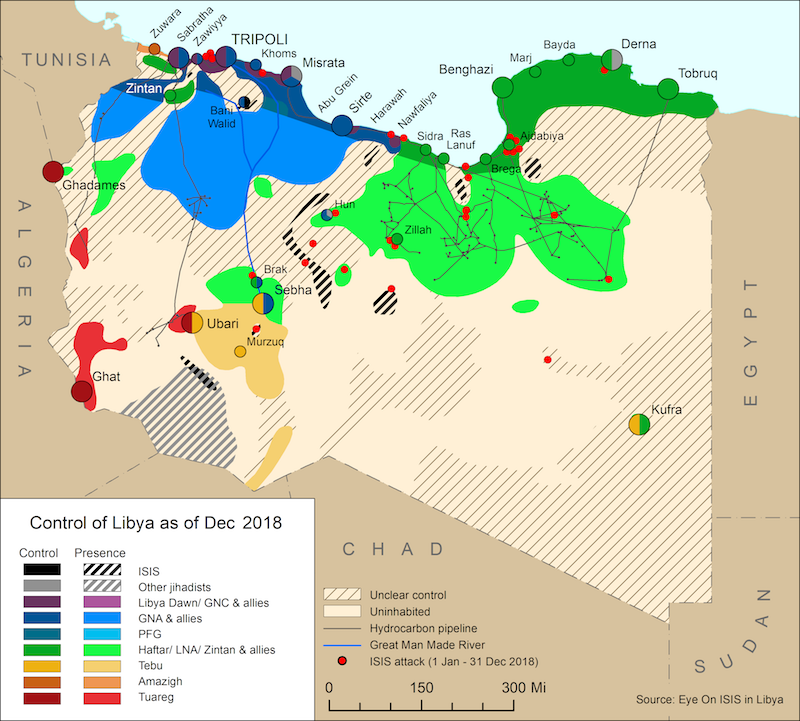 Islamist militants, who are part of the Benghazi Revolutionaries Shura Council (BRSC), staged a major attack on the main Libyan Special Forces (Saiqa) base in Benghazi, overrunning the camp and forcing Saiqa troops to evacuate. The head of the politburo of the Cyrenaican Transitional Council (CTC), Ibrahim Jadhran, who led the protests at the eastern ports, announced his intention this week to set up a military council in Cyrenaica to support Operation Dignity. Members of the Petroleum Facilities Guard joined Special Forces in Benghazi marking their first foray into direct combat as Islamist forces launched a counterattack against Dignity forces in the city. This week saw an attack against an Egyptian military post near the border with Libya and Sudan. The attack killed 21 Egyptian border guards and destroyed a weapons storage facility. General Khalifa Haftar continues to fight militant groups in the East, and thus far shows no sign of making substantive progress. Clashes erupted in Tripoli’s western suburb of Janzour between members of the Special Operations Force, which belongs to the Interior Ministry, and a revolutionary brigade with Islamist leanings called the Knights of Janzour, which is now part of the Libya Revolutionaries Operations Room (LROR). General Khalifa Haftar continued his assault on Benghazi. A stalemate emerged between Operation Dignity and Ansar al-Sharia in Benghazi amid heavy fighting. Hundreds of Turkish workers left Libya under threat from Operation Dignity. 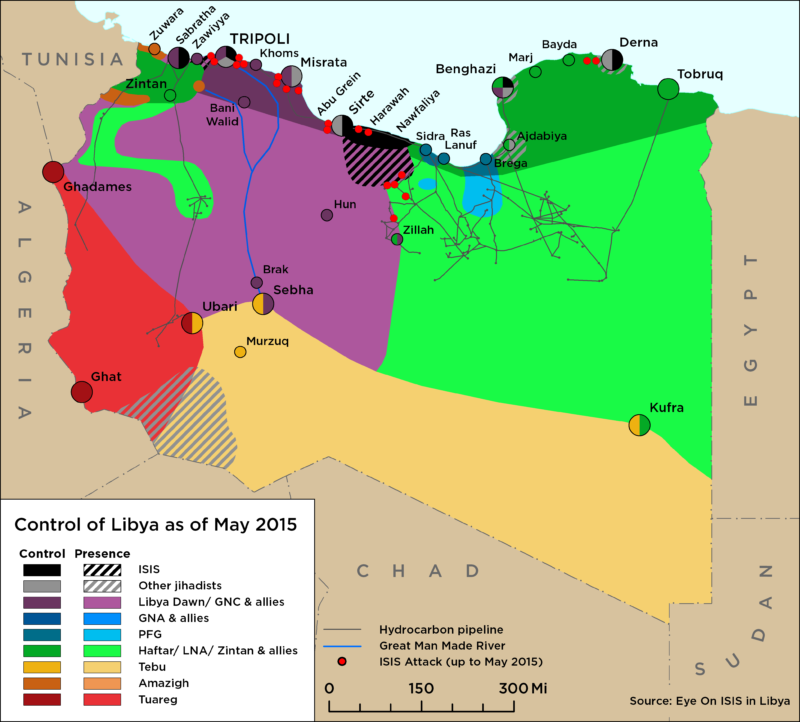 The rhetoric on both sides of Operation Dignity intensified on 15 June, when Haftar said that all “terrorists” coming to Libya should leave now or “die here.” In turn, the Grand Mufti called for “revolutionaries” to wage jihad against Haftar and his followers. Heavy fighting in Benghazi and Dignity attacks on boats in the ports of Benghazi and Derna ensued. Haftar’s forces claimed to have seized half of their targets. Tension over Haftar rose in Tripoli and a Tebu Brigade near Kufra joined Haftar. Libyan Air Force jets and helicopters struck Islamist positions in Benghazi.